Pronounced "coins" these are the end bricks of a wall. The corner bricks. Also refers to one vertical end of a wall, or a section of the end that is raised up first in the building sequence. 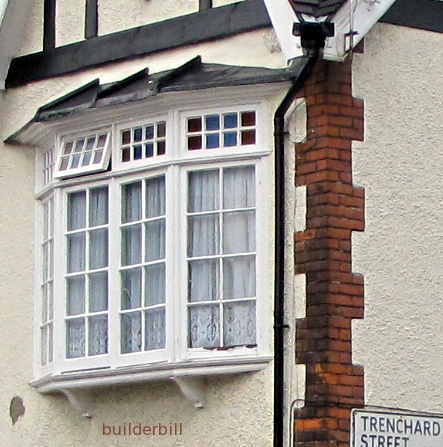 Above is a decorative brick quoin to a house that has most of the walls covered with "pebble dash", a rough textured plaster finish. When this is done the feature bricks are laid the thickness of the plaster (or a touch more) from the face of the other bricks. At the right is the same sort of thing, with a decorative brickwork effect (around a door opening) used in a stone wall. This was often done when good quality stone was not available. 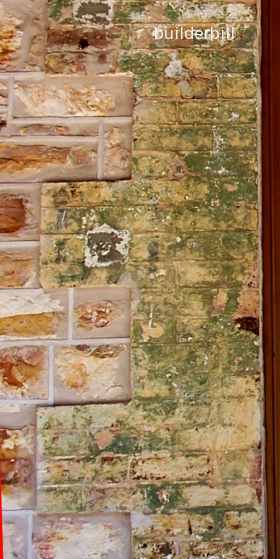 This particular on has seen better days with at least two colours of paint having covered the bricks at some stage.